The abuse will continue when “Fringe” begins its final season on Friday night. Having been beaten, tortured, killed and put into comas while repeatedly saving the world, Olivia (Anna Torv) suffers her greatest indignity yet: she’s turned into a piece of furniture. Literally. “Fringe” (Sept. 28, 9 p.m., Fox) Last season’s finale could’ve served as a tidy series ender — Peter (Joshua Jackson) and Walter (John Noble) vanquished William Bell (Leonard Nimoy) after he attempted to destroy both universes so he could be first in line at the petting zoo; Olivia (Anna Torv) died, as predicted by the Observer (Michael Cerveris), only to come back to life and reveal she’s preggers (busy day for that lady); and Walter enjoyed a Twizzlers with Astrid (Jasika Nicole). We could’ve all simply forgotten about Observer showing up to create havoc and moved on with our lives. But no. Now we have an entire final season of this “X-Files” heir to fill our Friday nights, and we feel obligated to stick around. We simply want to find out if they’re going to leap into that nerdy abyss and allow Nimoy’s Bell to grow pointy ears before boarding a starship; Rebecca Mader’s undead Jessica to reveal they’re on an island that can travel in time; or Katie Holmes to show up and take Pacey back to the Dawson’s Creek. Tonight, the role of Leonard Nimoy will be played by Anna Torv: William Bell, determined not to let a little thing like death (or the retirement of his actor) get in his way, possesses Olivia. Funny-ha-ha or funny-strange? That depends on how you feel about Anna Torv’s Leonard Nimoy impression. For some, it’s hilarious in a good way, for others, a cringeworthy disaster. Either way, it’s an impressively memorable performance. Don’t they know each other at all? Everyone can instantly tell what has happened, and Bell has no desire to hide what he’s done. Which is lucky for Peter, who has only just got over being tricked by Fauxlivia and might have a complete breakdown if he ended up accidentally romantically involved with Leonard Nimoy. This will all end in tears: At some point, William Bell is going to have to accept that he’s dead. Until the next time the universe reboots, anyway. Well that was fun, but it’s a relief to get back to normal: However you feel about Torv’s Nimoy impression, you can only listen to it for so long before you want her back to being herself, so it’s something of a relief when the next Bellivia episode involves animation and, therefore everyone is in their correct, if two-dimensional, bodies. As "Fringe" is omitted from the 64th Annual Primetime Emmy Award nominations, Leonard Nimoy has sounded off his disappointment. Taking to his Twitter on Thursday, July 19, the Spock of the original "Star Trek" series wrote, "No Emmy nomination for Fringe. Ridiculous.So much talent. So much hard work. So much imagination. LLAP." The 81-year-old actor, who has appeared several times as Dr. William Bell on the J.J. Abrams-co-created show, didn't only feel bitter about "Fringe" exclusion this year, but also because of the lack of appreciation given to "Star Trek" series. "Shouldn't be so surprised about Fringe. Emmy has given short shrift to Star Trek for 46 years. Amazing. LLAP," he added in another post. "Fringe" was nominated twice at Emmy Awards in 2009 and 2010, but didn't win any. With the sci-fi show entering its final season this fall, it will only have one last chance to get a kudo from the prestigious event next year. Leonard Nimoy has criticised the lack of Emmy recognition awarded to Fringe. The actor - who has made several guest appearances on the Fox sci-fi drama as scientist William Bell - took to Twitter to complain about this year's Emmy nominations. "No Emmy nomination for Fringe - ridiculous," he wrote. "So much talent. So much hard work. So much imagination." The Star Trek actor also retweeted several messages voicing disapproval that his co-star John Noble (Walter Bishop) had not been recognised. "Shouldn't be so surprised about Fringe," he added. "Emmy has given short shrift to Star Trek for 46 years. Amazing." Last year, Joshua Jackson (Peter Bishop) also expressed his disappointment at Noble's lack of awards. "Somebody's got to nominate John Noble," he insisted. "It's just getting silly now." ‘Fringe‘ fans were deeply saddened (thought not altogether unsurprised) to learn with yesterday’s 2012 Emmy nominations that the cult sci-fi series had been passed over entirely for any award recognition, in spite of years of groundbreaking work and the universally acclaimed performance or series star John Noble. Longtime supporter and sometime guest-star Leonard Nimoy too has felt the outrage, and has taken to Twitter to vent his frustration. ‘Fringe’ fans are certainly used to their share of heartbreak, what with the series continually passed over for mainstream awards, and escaping cancellation numerous times in spite of an outpouring of both fan and critical support. John Noble in particular, playing the delightfully eccentric mad scientist Walter Bishop is often touted as delivering Emmy-caliber work, yet never recognized by the voters. With the 2012 Emmy nominations, the second-to-last in which ‘Fringe’ would be eligible for any kind of awards, fans were heartbroken to learn that not a single category chose to recognize the series. Former ‘Star Trek‘ icon and sometime ‘Fringe’ star Leonard Nimoy seems equally outraged by the snub, touting the incredible imagination of the cast and crew, and comparing it to ‘Star Trek’s own history of being ignored for major awards. First introduced in the initial season of ‘Fringe,’ Nimoy recurred as Walter Bishop’s former partner William Bell throughout the second and third season, before making a surprise appearance in the climax of the fourth as well. Though his involvement remains to be seen, the story would dictate that Nimoy should have some presence in the fifth, and final season as well. IGN TV: Congratulations on the renewal! What did you guys think when you heard it? John Noble: It seemed like the logical thing to do, for are all sorts of reasons - certainly story-wise. I think it’s a good thing for television to do to keep its audience. We’ve done on our job on Friday nights, what was expected of us, so there’s really no reason for us not to keep going. IGN: Suffice it to say, I feel we’ve got to see William Bell again. Noble: I actually haven’t had that discussion with anyone, truthfully. [Leonard Nimoy] was terrific when he came back for those two episodes. He did a brilliant job, and I know he had a good time. I don’t know. I simply don’t know. But he would always be a popular choice, I think. In the 19th episode of the current season, "Letters of Transit;" it was implied that Leonard Nimoy's William Bell had somehow survived his apparent demise in the current timeline. The only problem with that is Nimoy very publicly retired from on-camera acting after appearing in the second season finale of "Fringe." Nimoy's only subsequent appearance on the series was via voiceover during an animated segment in the third season. Regardless, Wyman and Pinkner expressed optimism that Nimoy will return and indicated that the storyline will work even if Nimoy refuses to come back. “Once you kind of realize the extent of everything, it will probably become clear why we’re not [writing ourselves into a corner],” explained Wyman. This third season is awash with interesting cases, stand-out episodes and sequences (the computer generated ‘cartoon’ segment is an absolute joy), and a forking arc that threatens to blow your fragile little mind (that said, SOUL MAGNETS?! Really?). Some of the season’s best moments come from neither universe at all, in fact, but are instead the by-product of a backstory that is almost as interesting as the struggle at hand. The relationship between Walter and William Bell (Leonard Nimoy) is endlessly compelling, and any insight into their past is always very welcome. Flashing back to the characters’ youth, we serve witness to events that we have to this point only heard about; it is a decision that helps to flesh out a very engaging story that is forever on the move. Eye on Emmy: How Fringe's Anna Torv Finds the Reality Amid the Unreal. Anny Torv about the third season of Fringe. TVLINE | This season, you played Olivia, “Bolivia,” Bolivia-as-Olivia, and Olivia as… Leonard Nimoy. How did that work out for you? This season was my favorite so far. You do a show, and there are things you do every episode – like, we always have a crime scene – so to all of a sudden throw it in the air and be given the chance to play a whole lot of different stuff is fun. (...)TVLINE | Talk about how you worked with John Noble to nail down what was basically an impersonation of an in absentia Leonard Nimoy. I was not excited when that script came out. I was fearful. So what do you do? You call the people that are much better than you and say, “Help!” [Laughs] John had worked with Leonard, plus I was so, so nervous, I wanted to make sure that when I went to set to do it for the first time there was at least one person that I could look at who I had done it with before and trusted. It offered an element of comfort. TVLINE | Did you ever get a note from Mr. Nimoy? Entertainment Weekly talked to the producers of Fringe and asked if we saw the last of Mr. Nimoy's character. EW: Is William Bell (Leonard Nimoy) gone for good? For those who like me might find themselves in need to look up the meaning of TBD, it's the abbreviation for "to be determined." Whether Mr. Nimoy will return in the upcoming episode is still not entirely clear, but chances are good to bring him back as William Bell during a trip the team takes on the wings of popping some LSD. When last we saw our gang of FBI agents and consultants, Olivia had been possessed by the disembodied spirit of William Bell (Nimoy) who was working with Walter to find a way to occupy a more permanent host. While the character returned, Nimoy didn’t -- instead actress Anna Torv gave her best Ambassador Spock impression. But the occupation somehow went wrong and Olivia/Bell collapsed. According to the promos released by Fox, Walter and Peter must find a way into Olivia’s mind -- through hard work, tenacity, and good old-fashioned lysergic acid diethylamide. Is Leonard Nimoy Coming Back to Fringe? William Bell isn't really dead, as long as we find a way to remember him. Right? The latest Fringe promo featurette for upcoming episode "Lysergic Acid Diethylamide" sees the cast coyly suggesting that Leonard Nimoy has indeed come out of acting retirement to make an appearance as his late character William Bell! Up until this point Anna Torv has been channeling her best Leonard Nimoy impression while the character occpies (sic.) Olivia Dunham's body, having been disintegrated in the second season finale. Leonard Nimoy has publically retired from acting, but suggestively tweeted the character's return months ago in a presumed reference to Olivia's current possession. The cast seems aloof in the below video, but could Nimoy himself make an appearance? The oddly familar voice at video's end would suggest so! From way back when we all thought Mr. Nimoy was going to retire here's a FOX news report. We've heard rumours that William Bell will be back - can you say anything about that? "I've heard the same rumours! In fact, I think Leonard [Nimoy] announced it on his Twitter or something. All I can say is that there will be a return of Leonard's character in a way. In a way. It's not going to be, 'Hey, here's Leonard again'. It will be something different but really quite bizarre. Very bizarre, in fact." In the episode Stowaway Olivia continues to channel William Bell to Walter's unbridled elation. Peter is unhappy with the arrangement of Bell inhabiting his lovers body and wants him evicted yesterday. Bell assures the Fringe team there won't be a problem since Olivia's consciousness would be in a state of rest. That would give them the time needed to find a new human body to host him. Which might take weeks since Bell's requirements are quite specific. Urgency is introduced when suddenly Olivia surfaces for a few seconds at the end of the episode at the sound of a distant church bell, prompting William Bell to remark that he might have been wrong and things are a bit more complicated than he thought. Anna Torv creates Bellivia by channeling Leonard Nimoy. I was very iffy on the prospect from what little I saw last week. I came into this week expecting to dislike Bellivia. The rasp of her voice seemed almost goofy, but I hardly noticed since “Fringe” did everything else right. The cadence of her words was dead on, and his/her interactions with everyone else in Fringe Division were pitch perfect. Peter is understandably angry that Bell jumped into Olivia’s head; while Walter enjoys the situation a little too much. I don't think he showed any concern for Olivia. He was too busy playfully solving word problems on opposite sides of a transparent dry erase board with Bill Bell. Anna Torv creates Bellivia by channeling Leonard Nimoy. I was very iffy on the prospect from what little I saw last week. I came into this week expecting to dislike Bellivia. The rasp of her voice seemed almost goofy, but I hardly noticed since “Fringe” did everything else right. The cadence of her words was dead on, and his/her interactions with everyone else in Fringe Division were pitch perfect. Peter is understandably angry that Bell jumped into Olivia’s head; while Walter enjoys the situation a little too much. I don't think he showed any concern for Olivia. He was too busy playfully solving word problems on opposite sides of a transparent dry erase board with Bill Bell. According to Trek Movie Mr. Nimoy didn't say a word at the Creation Con in San Francisco this Saturday about what direction his further involvement with Fringe will take. The series itself got one step closer to bringing William Bell back in the episode Os. Walter is dearly missing his old lab partner as universes unravel and fixates on a theory Bell looked into involving "soul magnets." But please let Walter explain himself and heed what happens when he rings William's bell. Since Fringe was moved to Friday night, there are concerns that the series faces cancellation. To promote it a new trailer, "Friday's Reanimated," was launched that includes William Bell's farewell from last year's season finale. With Mr. Nimoy's recent announcement that William Bell will be back, reanimation seems to be the keyword, indeed. Whether this is what Mr. Nimoy referred to in his tweet about his return to Fringe remains to be seen, but it's damn sure a nice touch by the people who run the series to keep "Belli" around (with a little help from Photoshop) after his probable heroic demise. The stills are from the episode Concentrate And Ask Again and the in-joke of William Bell keeping a book by Dr. Spock around is much appreciated. At http://www.fox.com/fringe/thereismore/ a Fringe ARG website existed in 2009 which is now defunct. At FringeARG the contend is preserved, though. Among which is this clipping of a short bio for William Bell. On top of the clipping are letters in braille. According to the page the braille reads "as letters: 'add hi ee cd ba ae hc' and numbers: '144 89 55 34 21 13 8 5'"
Massive Dynamic, of course, has it's own company website. When you click on the photo for William Bell, the same text as in the clipping above will appear. At the time the page was launched, though, the part hadn't been cast, since a very generic picture was used for the CEO's profile. Maybe Christopher Lloyd became the victim of a wrong assumption? At Give Me My Remote the producers of Fringe clarified that, unfortunately, what he said at the convention wasn't true. Can you imagine how epic it would have been to have Lloyd, Nimoy and John Noble sharing a scene? Oh well. As someone remarked in the comments: "If Lloyd wasn’t misquoted/mixed up, my guess is that his character meets a young William Bell and he just assumed it would be Leonard Nimoy." So, lets wait and see who or what (remember Brown Betty?) will turn up in episode ten of the current season. Lloyd then mentioned that he will be soon filming an episode of Fringe. Lloyd’s casting (in the tenth episode of the current season) as a musical icon and hero of Walter Bishop on Fringe was reported last week, and included in the latest TrekMovie Sci-Fi TV update. However, Lloyd then made some news, revealing that Leonard Nimoy would be joining him in the same episode of Fringe, reprising his role as William Bell. The audience, to say the least, was very enthusiastic about that information and it was exciting news generated at the convention. However, speaking on the DVD commentary track for the episode, showrunners Alex Kurtzman and Roberto Orci admitted that they plan to bring Nimoy back in a future episode. The pair also referred to Bell's exit as an "apparent death". It's probably never going to happen, but if Mr. Nimoy should ever change his mind, show runner Jeff Pinkner told the audience at ComicCon that "Fringe has 'another story to tell' about William Bell." Source: E! Online. Regarding Leonard Nimoy's retirement, "Leonard has now retired twice. He's our Brett Favre," says Pinkner. They talked him through his story and he said he'd come back for Season 2. "He was initially nervous that we just wanted him for promotional value, but we wanted to give him sort of a swan song role." Should Nimoy come out of retirement, they will have more stories to tell. "'Fringe' Stars Talk Nimoy’s Final(e) Performance"
While we are bidding farewell to some notable genre shows this year like “Lost,” “24,” “Flash Forward,” “Happy Town,” and “Heroes” (in addition, I am still mourning the loss of “Dollhouse”), some good news to report is that “Fringe” will return to FOX for season three in the fall. Stars Joshua Jackson and John Noble spoke with Access about their season finale, which featured Leonard Nimoy in his last performance. 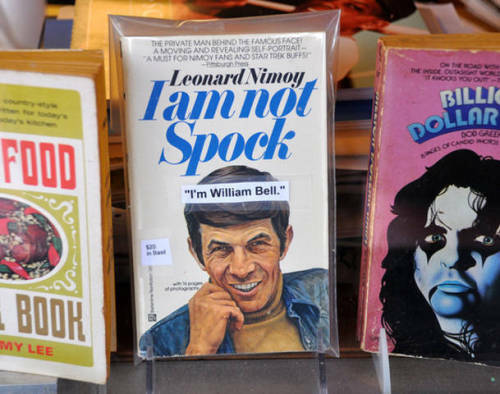 “Leonard is probably THE icon of science fiction television,” Noble said. John Noble, who had his long awaited encounter with Nimoy in the season two finale, was very pleased about the intricate storylines featured on the show this year. “You can drop in when you want to, but for those fans who have been rabid from the very beginning, we are paying off that dedication,” Joshua added. “If you put in that time, you really get something back out of it. And that’s really good storytelling, Jackson said. "Leonard Nimoy's Good-Bye in 'Fringe' Finale"
John Noble and Joshua Jackson comment on working with Leonard Nimoy in this news bit on FOX. "Fringe: A Tale of Two Olivias"
Anna Torv about the season finale of Fringe and Mr. Nimoy's final scene as an actor. IGN: We recently learned that Leonard Nimoy has retired from acting, and that the final scene he shot was with you. Torv: I know! And it was actually that scene that you saw in the last episode. We didn't know that. Yeah, I can't believe that! That was a shock, when I found that out afterwards. IGN: It has to be kind of cool though, to think, "I performed with Leonard Nimoy in his final scene as an actor." Torv: Yeah! Can you believe that? I got to clap him out. Yeah, that was pretty [great]… But we didn't know! He's so unassuming and beautiful that he just didn't make a big deal out of it. I wish he had! Any chance of Leonard Nimoy returning at a later date? "I hope so, I really do. He's just such a beautiful man. He's extremely graceful and gracious. There's a presence about him that would be there whether he was Leonard Nimoy or just a man! He's got a gorgeous essense to him." In a much younger version of himself, Ashley Edward Miller used to set up the camera in front of his television as a way capturing the magic of the original "Star Trek" series that he could play back whenever he wanted. Watching the voyages of Kirk, Spock and McCoy on the USS Enterprise inspired Miller to do many things. But never did he expect he would actually put words into the mouth of Leonard Nimoy, a legend in his own right. Miller however got to do that not just once, but twice on the Fox series "Fringe." That included the most recently aired episode "Grey Matters," which aired Dec. 10 penned by himself and regular writing partner Zack Stentz. "It was certainly exciting, and it has been exciting that we've been able to have him" on the show," Miller told Alpha Waves Radio in a show that premieres online Thursday. "We've actually written three [episodes] now, and had two air. Of the two that have aired, Leonard was in both of those episodes, and that is tremendously exciting for a geek to write for Leonard." Will Leonard Nimoy Do More Fringe? Q: What are your plans for Mr. Nimoy on Fringe? J.J. Abrams: In terms of his role as William Bell, none of us could believe our luck that we convinced him to say yes to being on the show. He is wonderful on the show. And, I will say that this is not the last you will see of his character. I don’t want to give anything away, but this is not the last you’ll see of him. He is so good and so wonderful to work with that I wouldn’t limit the possibilities of what he’ll get to do. John Noble reveals in this interview that he and Leonard Nimoy discussed ideas where to take their characters while filming their episode that contrast Mr. Nimoy's earlier statements that he has finished his commitment. Abrams spoke first about Nimoy's role on the show. "In terms of his role as William Bell, none of us could believe our luck that we convinced him to say yes to being on the show. He is wonderful on the show and I will say that this is not the last you will see of his character." When asked if Bell would be squaring off with his former partner Dr. Walter Bishop (John Noble) this season, Abrams had this to say. "I don't want to give anything away but like I said, this is not the last we'll see of him and I think that he is so good and so wonderful to work with that I wouldn't limit the possibilities." What's it like working with Leonard Nimoy? JJ: I've been shafted so far; in fact I'm going to lodge a formal complaint through this conference call. Leonard's been up here twice and while I did get to meet him and that's cool, I have yet to be able to do a scene with him and I think that's un-cool. That's something that needs to be added to the Peter and Walter Bishop, I mean William ..., scene tout de suite. They did a wonderful job the first season of just sprinkling in mention of Walter Bell, so at a point, even though we hadn’t seen him, he was still a major character in the show. There was something the other day of Walter defending Bell, saying, “He wouldn’t do this.” And I was thinking, we’ve really given this Bell an intricate background well before he came. We were giving him a hell of an introduction. And how perfect is it to just give him the final scene of the season. And to have Leonard Nimoy, such an icon of science fiction, play him as well. Wasn’t that an achievement? It’s a huge compliment to "Fringe" that Leonard would come back and do it. I get pretty pleased to see people like Nimoy believing in us enough to come back to work with us. When you have someone like Akiva Goldsman who’s so keen to write and direct for us. That’s a pretty powerful statement of our potential. "Leonard Nimoy remains on the 'Fringe' at Fox"
Anna Torv, who stars as Olivia Dunham on "Fringe," said it was "extremely" cool to have a sci-fi TV legend like Nimoy — most famous for his "Star Trek" role of Spock — on the set. "Unfortunately, the set wasn't very cool when he was on there, though," she added. "It was like a heat wave in Vancouver." "Fringe" is produced in Vancouver, British Columbia, where you might think it would be cooler than, say, Los Angeles. But that isn't always the case. "It was 106 degrees outside," Pinkner said. "And unlike Los Angeles or New York, the sound stages in Vancouver don't have air-conditioning. It was 120-some degrees inside, and like a pro, (Nimoy) sat there all day. He never went back to his trailer, and did pages and pages and pages of dialogue and scenes with Anna." "Well, he's from the planet Vulcan," joked Joshua Jackson who stars a Peter Bishop. "He's used to that kind of heat." And, while Nimoy didn't perform any Vulcan mind melds, he did apparently use mind powers during his guest stint. "Sincerely, his wife told me that he practices biofeedback," Pinkner said. "And he just sort of, like, regulates his body temperature, which is very Spock-like. ... I was dying." One Fringie who'll never have to worry about his place on the show is Leonard Nimoy. Pinkner said that Nimoy will be part of the series for as long as he wants to be. Let's hope that's a long time. Walter Bishop and William Bell will meet in the fourth episode of the second season. Noble told us, "I'm doing my first scene with Leonard [Nimoy] next Wednesday. 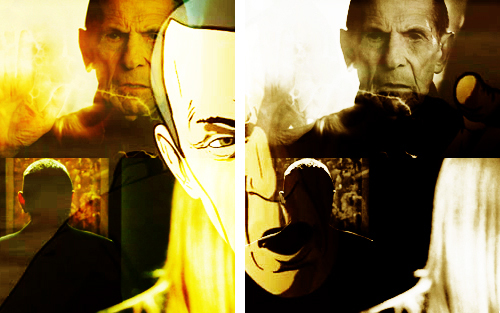 On Fringe, is William Bell the answer to some of the questions we've been asking about the Bishops and Olivia? Several answers will come outside of William Bell, and then William Bell will be the beginning of the answers to even bigger questions. How do you see the relationship between Walter Bishop (John Noble) and William Bell (Leonard Nimoy)? We always imagine that they were two of the smartest guys in their classes, and they went through the Ivy League together. At that point in college, you're discovering yourself, but these guys, the intelligent geniuses they are, they might come to conclusions about what's important in this world. So we always imagine that they were very much like each other, very much friends, and very much a team—brothers in a way, and that life took them in different directions, either complementary or not directions, and we're going to find out. Way back last summer, we talked about how the Pattern could be about either saving the world or destroying it. Do Walter and William take those different approaches to the Pattern? That's absolutely right. They have not only different approaches to the Pattern, but different interpretations of what the Pattern is. The Pattern is slightly in the eye of the beholder, you're going to find out. And sometimes what you think is real can become real. In a way, these two are the top minds in the world attempting to figure out the Pattern and how to react to it, based on their world view. "Fringe: J.J Abrams Talks Nimoy and Next Season!" "I called him and I essentially started begging," said Abrams. According to the Trek helmer, Nimoy was familiar with Fringe but hadn't actually taken in an episode at the time the pitch was made. Abrams explained the appearance of William Bell, Fringe's equivalent to the man behind the curtain, as a "big deal for the show," not just because of where Bell comes from and his back story but where he's going. "It would be an obvious honor" said Abrams regarding the casting of Nimoy. "He was open to the idea of it but of course wanted to see the show and read some pages so we sent him everything we could. He thought it was intriguing and interesting and that's actually how we got him to return to the role of Spock in Star Trek. We pitched the thing and his response was 'interested intrigue' and I knew that was a good sign." As for what to expect in tonight's finale, Abrams referred to the episode as a "tentpole episode in the mythology of the show," and a "massive turning point in the long term arc of the series." When asked if he had anyone in mind for the part of William Bell from the beginning, J.J. revealed that there was talk of the reclusive mastermind making an appearance earlier on but as the show found its first season pace, it was decided that Bell's unveiling should be pushed back a bit. For Leonard Nimoy, I'd say it was worth the wait. They talk about Leonard Nimoy being on their show at 2:27 and 1:17 to (counter runs backwards) the end. "Abrams and Cast Talk Fringe - IGN at Paleyfest '09"
At 4.07 Anna Torv mentions having a scene with Leonard Nimoy and J.J. Abrams says at 4.36 that he will play a very important role in the structure of the entire next season but doges the question whether William Bell is good or evil. "Collider Attends the Paley Festival Salute to FRINGE"
On the topic of Nimoy’s roles as William Bell, J.J. confirms that he hasn’t just signed on for one episode. He also mentioned that it was an honor to work with him on Star Trek and that he never thought he would work with him again. When they were thinking of actors to consider for the role Burke suggested Nimoy and J.J. thought it couldn’t be more perfect. Nimoy loved the idea and also brought his own ideas for the character, ideas that explain how he and Walter could have worked together in the past. John hadn’t met him before filming but was so happy to have such a big icon of the science fiction genre on the show. Anna and John said very little on their scenes with him, but J.J. jokingly asked Anna if she did the Vulcan sign and she admitted that she had wanted to. J.J. Abrams talks about Blair Brown (Nina Sharp) and casting Leonard Nimoy as William Bell in Fringe at the PaleyFest April 23, 2009.